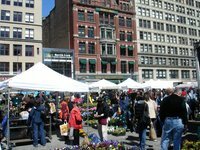 Several weeks ago New York Magazine did a map of Union Square and pointed out that it has become a major urban hub and is completely and totally revitalized. Well all of that is true, but I can’t believe they left Union Square Ventures off of their map. I spent some time today with The Gotham Gal’s Sony Cybershot 7 megapixel camera and had a blast with it. It’s a great camera. 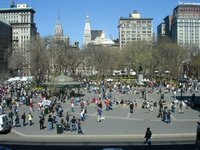 So I figured I’d shoot some of the top sites of Union Square. 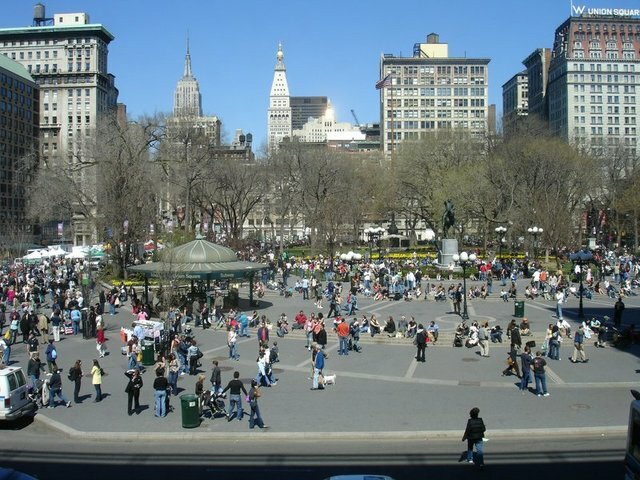 This is the view from the "picnic room" on the second floor of the new Whole Foods in Union Square. It’s a great spot to get a smoothie or a cup of coffee and you can also get lunch downstairs and bring it up. The view is spectacular as you can see. The crowds were out in force today in the park. Spring fever is in the air bigtime in NYC this weekend. 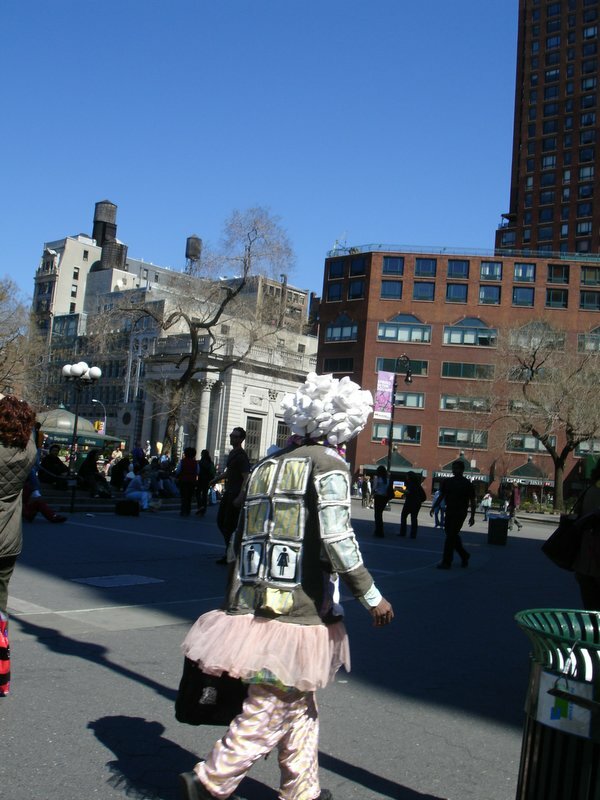 New York is always a freakshow of some sort or another. This guy looks like he’s a member of Parliamient or Funkadelic. But honestly, its stuff like this that you just don’t get in most parts of the country. This guy was carrying a briefcase, so maybe he was headed to work. 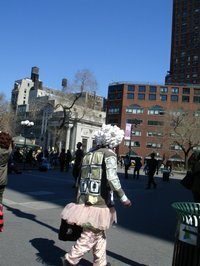 Whatever the case, he was not out of place in Union Square today. There is a greenmarket in Union Square several days of the week and on saturdays. It’s always packed but today it was a madhouse. It seems that wheatgrass is the new big thing this year. There were several vendors selling wheatgrass. I haven’t seen them in prior years. 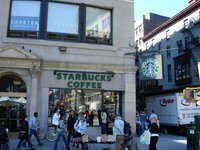 This is our Starbucks. When we need a mid afternoon lift, its off to Starbucks. This is one of the busiest Starbucks I have ever been in. There is always a line and hardly ever a seat. And always laptops using wifi everywhere. 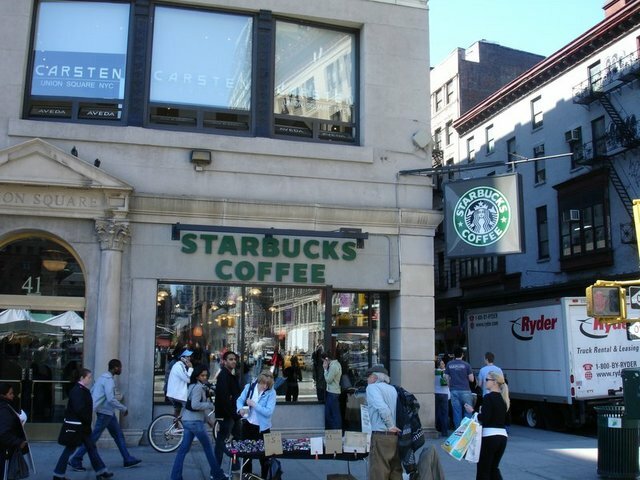 Starbucks should make a commercial at this store. It kind of defines the brand. 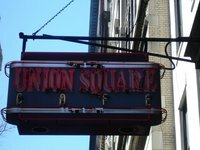 Union Square is halfway between my house and my office. 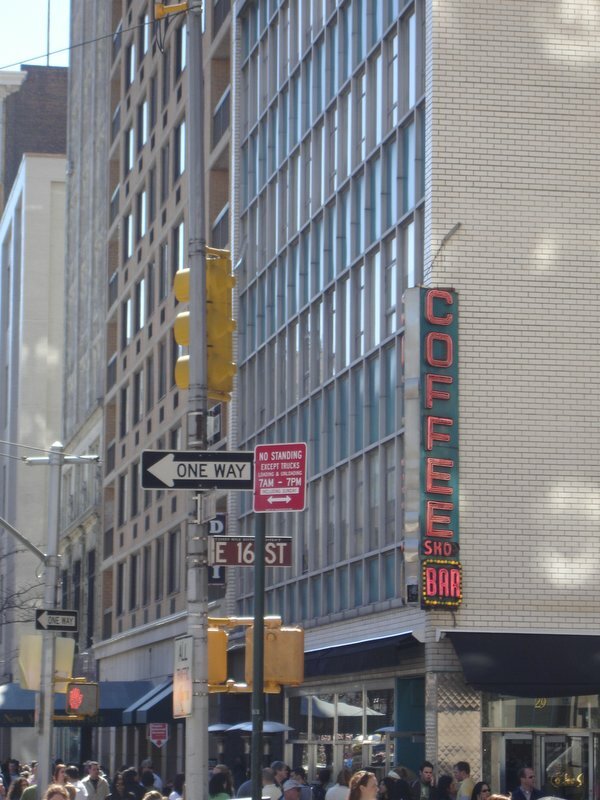 And right in the middle is the Coffee Shop. So its my favorite place to do a business breakfast. Plus its owned by people who also own a modeling agency so the food isn’t the only attraction. I probably eat there at least once a week. Lunch is also quite the happening at the Coffee Shop, but I tend to frequent it more at breakfast. 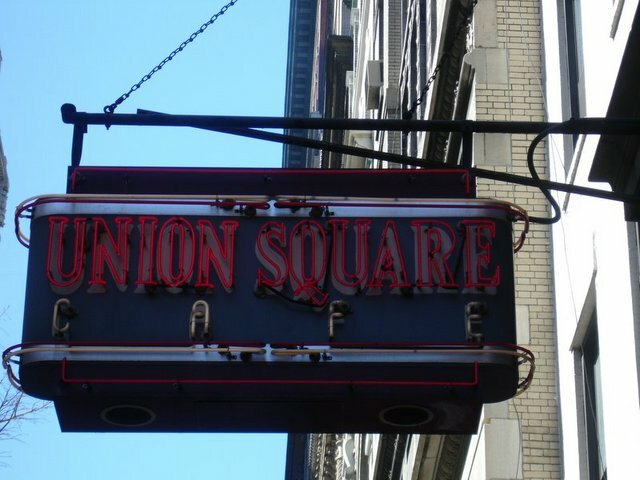 The guy who really deserves credit for the revitalization of Union Square is Danny Meyer who opened the Union Square Cafe in 1985, At the time, the neighborhood was a mess and the park was a disaster. Danny’s never ending evangalism has paid off in spades. It’s great that the restaurant is still fantastic and in fact has been #1 in Zagat’s NY for the past six years. That’s my trip through the park today with The Gotham Gal’s camera.